Like many well-run, successful businesses Professional Pavement Products, Inc. has a clearly defined strategic vision. Appropriately named Vision 20/20 professional pavement products vision encompasses and clearly defines the organization's key thrust, initiatives and goals through the year 2020. 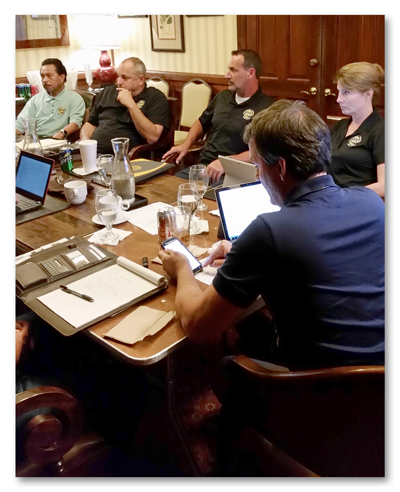 Every quarter the leadership team of Professional Pavement Products comes together for two days to discuss and determine the company's goals and priorities. “The primary purpose of our team is to utilize the more than 100 years of combined industry and business experience to develop and champion an effective strategic plan.” says Greg Driskell president and founder of Professional Pavement Products and an avid strategic planner. Professional Pavement Products uses specialized strategic planning software and processes to ensure alignment of the company's actions to its Visions priorities and goals. We take strategic planning very seriously around here says Monika Thompson, national sales manager and 18 year veteran of Professional Pavement Products. "Everything we do ties back to our brand promise of products service and knowledge. And then to our core values" Professional Pavement Products core values include the Honor, Impact, Grow, Serve and Innovate. Professional Pavement Products utilizes its unique strategic planning process as a primary tool in building on and adding to its 20 years of success in the industry.